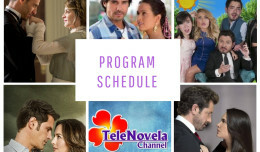 In the Name of Love: Episode 32 | TeleNovela Channel - Bringing you closer to lifes drama. Greed will always end in tragedy as poor Arcadia suffers the wrath of Carlota after extorting money by blackmail. Meantime, Paloma helps Macarena to dress up for a date while Aaron stands up to Carlota to ask permission to take Paloma to the movies.